This wonderful villa comprises two holiday homes, each with their own patio. Together with the other residents, you have a large swimming pool, a spacious garden and a washing machine. The house, dating from the 16th century, has been fully restored. From the garden you have a panoramic view of the area, you can even catch a glimpse of the Adriatic coast in the distance. 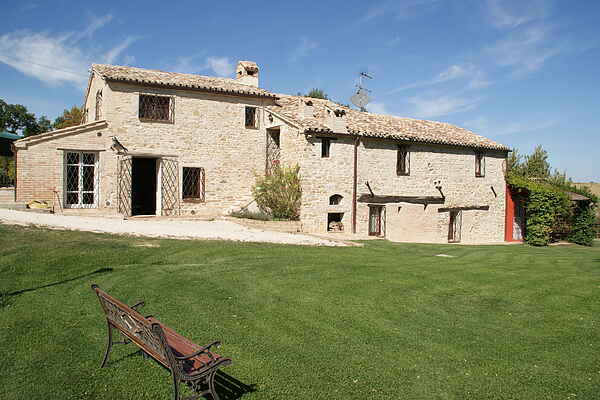 The house is situated in a unique location, not only because of the wonderful countryside of Le Marche but also as there is plenty of culture to enjoy. You can wander through the splendid medieval streets in Macerata, 23 kilometres away. The lovely city is situated on a hill and has many Baroque churches and palaces. The famous Sferisiterio open air theatre, built in 1819, is a wonderful place to visit. Performances are still held here in summer. You can spend a day at the beach too, the closest beach is in the town of Porto Recanati, 40 kilometres away. One of the most beautiful stretches of coast is to the north of the city of Loreto: Conero Riviera.